Obituary for George Anthony DiMatteo | McDonald-Aeberli Funeral Home, Inc.
George Anthony DiMatteo passed away on Saturday morning, September 1, 2018 in Wexford, PA surrounded by his family. George died from infectious complications due to his treatment for acute lymphoblastic leukemia. 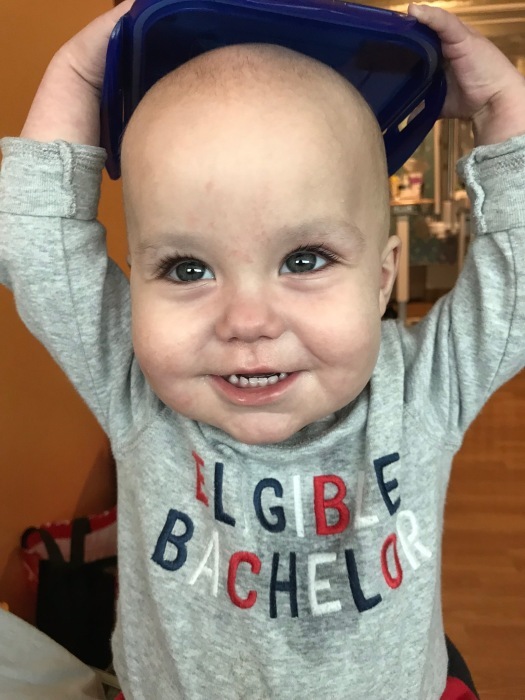 George was diagnosed with leukemia at the age of two months; he was successfully beating cancer until he developed a lymphoproliferative disorder due to his weakened immune system from chemotherapy. George was born in Southfield, MI on August 24, 2016. He spent most of life in the hospital, both at the University of Michigan and in Pittsburgh undergoing chemotherapy. He endured adversity with laughter, play, and giving much love to family, friends and medical staff. He brought joy to his family and loved spending time with his brother Joey and dog, Rosie. They loved playing outside, having dance parties, and watching Boss Baby. George loved to eat chips and donuts and loved to stay up all night playing. George endured his trials with grace and strength. His legacy is his family who will live their lives in his name. George is survived by his parents, Molly and Anthony DiMatteo and his older brother Joseph. George is also survived by his maternal grandparents, Mary Beth and Joseph Spore and paternal grandparents, Julie and David DiMatteo. Additionally, he is survived by his loving aunts, uncles, and cousins and great grandparents, Bernadette and Rudolph Roitz, Alice and Joseph Spore, and Geraldine and Robert DiMatteo. Friends are invited to a Mass of Christian Burial at St. Kilian Roman Catholic Church, 7076 Franklin Rd, Cranberry Twp, PA 16066 on Saturday, September 8, 2018 at 10:00 AM, with Rev. Charles Bober, pastor, officiating. The family will greet friends from 9:00 AM to 10:00 AM at the church. Burial will be in Holy Savior Cemetery, Richland Twp., PA. In lieu of flowers, memorials may be made to the Ronald McDonald Charities of Ann Arbor (https://rmhcannarbor.org/donate) or C.S. Mott Children’s Hospital (https://www.mottchildren.org/giving). Arrangements are under the direction of the McDonald-Aeberli Funeral Home, Inc. 238 Crowe Ave. Mars, PA 16046 and condolences are available at www.mcdonald-aeberli.com.